"Even if traders knew the exact future volatility but hedged themselves (rebalanced the gamma) at discretely spaced increments, they would have difficultly predicting the final P/L". "If they traded every millionth of a second they would get a P/L with certainty. Increasing the frequency of adjustments would compress the results as shown"
"The mean is the Black Scholes Merton value of the security"
I find this very much starts at the deep end and is fairly poorly explained sentence. Could someone please help me make sense of this. He's saying that if you know the volatility, and you hedge continuously, you can lock in the exact Black-Scholes price. Any deviation from that delta hedging scheme must result in noise. ie the replicated price must have a distribution with some width around the theoretical value. This noise does not create systematic profit or loss, because it's just doing market transactions in the underlying stock. 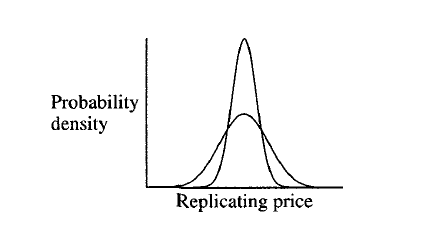 Hence the distribution of the replicated price is still centered around the theoretical value. The greater the deviation from continuous hedging, the wider the distribution of the replicated price. Nothing earth shattering. Not the answer you're looking for? Browse other questions tagged options option-pricing hedging gamma or ask your own question. how to use known premium of options to determine premium of options with another strike?